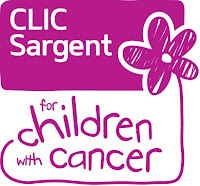 When I read about the CLIC Sargent Do Something Yummy awareness campaign I just had to join in as any causes connected to cancer or children are close to my heart and I like to do my bit to help worthy causes like this. 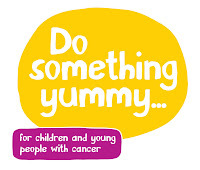 Yummy Mummy is a fundraising campaign run by the children’s cancer charity CLIC Sargent. For the last six years mums all across the UK have been raising money for this fantastic charity that helps children with cancer and their families by taking part in Yummy Mummy Week. This year mummies are asked to Do Something Yummy to help raise money for CLIC Sargent during the Yummy Mummy week that will take place from 10th-18th March 2012. Nickie who blogs at I Am Typecast is promoting CLIC Sargent and the #dosomethingyummy campaign with weekly writing prompts during February helping to raise awareness of this marvellous cause. It would be great if you could show your support for this fantastic charity and #dosomethingyummy campaign. Bloggers can get help raise awareness and show their support by writing a post using the weekly prompts and linking up on I Am Typecast. You can also help by joining the Yummy Mummy week facebook page, use the #dosomethingyummy hashtag on twitter and add a twibbon to your twitter avatar and facebook profile picture. Get involved, raise awareness and help raise money for this amazing charity during Yummy Mummy Week. I have always wanted children, being in a happy relationship and having a little family was a dream that I hoped would one day become reality. For years I worried that I would have problems conceiving or not be able to have children as I suffer from PCOS and I did not know if fertility problems would be another PCOS symptom that I personally suffered from or not. I even doubted whether I would find the ‘one’ to settle down with and as another year would pass and the ‘one’ was still a fantasy I seriously thought I wouldn’t have my dream of having a family before I was 30. Then out of the blue when I was 25 I met Lee. We were a long distance couple for a while and after 5 months Lee moved to Wales to live with me. Within a month of living together Lee proposed. The following month we found out I was pregnant!! My dream was becoming reality. I loved every minute of being pregnant, even the constant sickness for most of my pregnancy, consultant appointments and developing gestational diabetes didn’t affect how much I loved being pregnant. Feeling my little baby move and grow inside of me is the most amazing feeling that I have ever experienced. 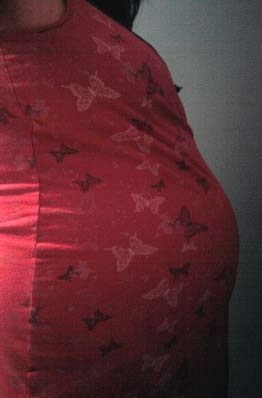 I loved my bump and miss it terribly. Exactly on his due date my little man made his appearance. It was the most amazing, tiring, blissful experience of my life and holding my baby in my arms for the first time took my breath away. It is true what other mothers say, that you forget all the pain of childbirth and it was all worth it for your bundle of love. Tristan is 10 months old now and I have loved every second with him. It has been a joy seeing him grow and change from the vulnerable, little baby we brought home from hospital the day after his birth to the cheeky, happy little man he has become. I cherish my memories of Tristan and hold them dear to my heart. I have breastfed him from birth and I love the bond that we share. I have loved being awake in the early hours of the morning, in spite of tiredness, breastfeeding my angel whilst the house is deadly quiet. Looking down at his beautiful face and sparkly blue eyes as he feeds, wriggling his little feet is so relaxing and blissful. Tristan makes me want to be a better person. My little man completes my life, he is everything to me and I love him more than I could ever put into words. I am so proud of him and feel over the moon when he masters new milestones, his face beams with happiness when he has learnt a new ‘trick’. My heart fills with happiness and love when I hear him say ‘mama mama’ and when he makes his own way to me to give me a lovely cwtch. I see so much of Lee in Tristan and everyone says ‘he looks so much like his daddy’. I love that he has his daddy’s sparkling, bright blue eyes that are so striking. It is beautiful to see Tristan playing with daddy and I know that Tristan means the world to Lee and is Lee’s fresh start in life. Even though being a parent is demanding, there are always chores to do and I am mentally and physically exhausted most of the time I wouldn’t change it for the world. I adore my little man who is full of love, fun, giggles and cuddles. He has given me a new lease of life, I want to enjoy life and experience new things with him. He always puts a smile on my face even if I am having a bad day his cuddles lift away the darkness. He is my future. He is my world. I would do anything to protect him. I can’t imagine my life without him. I hope he has a happy, healthy life and I will try my best to nurture, care and support him and I will always be there for him. Tristan is the centre of my little family, his happiness and fun is infectious. He is special and unique with his own amazing little personality. 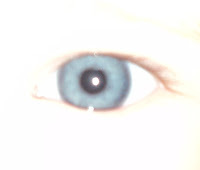 It is because of how Tristan makes me feel that I hope one day he will have a little brother or sister. I look forward to experiencing another life I made with Lee grow inside of me. To hold another baby of ours in my arms, develop a strong bond of unconditional love and watch them grow and develop will be extraordinary. I have a new dream of having another bundle of love in our little family and that my child (hopefully children) will have a life filled with love, health and happiness. I love the "he makes me want to be a better person" line. That's so true! Thanks for writing this post for the #dosomethingyummy campaign.